The bear can be seen just to the right of the car. To watch the video, scroll down. A wayward — and apparently grumpy — bear that found itself locked inside a Kneeland neighborhood car was freed unharmed today after responding deputies were able to open the door from a safe distance by tying a rope around the handle. In a video of the rescue posted to the Humboldt County Sheriff’s Office Facebook page, a voice can be heard urging, “come on bear,” before the animal jumps out of the four-door sedan and makes a run for it into an adjacent wooded area without a backward glance. Still unknown is how the “gray faced adult black bear” got into the car in the first place. On 07-10-17 Humboldt County Sheriff’s Deputies responded to a residence on Greenwood Heights for a call of a bear locked in a vehicle. Once on scene Corporal Borges, Deputy Crotty and Lieutenant Fridley found a gray faced adult black bear locked in a vehicle. The bear was very aggressive and snapped at the window anytime someone would get close to the vehicle. With the help of vehicle owner the vehicle was unlocked. Deputies tied a length of rope to the door handle, wrapped it around a tree and fed it back to a patrol vehicle. 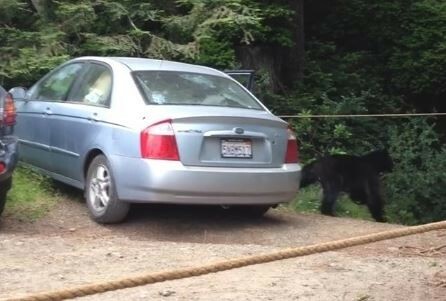 From a safe distance the rope was pulled which opened the door and allowed the bear to exit the vehicle. It is unknown how the bear was able to get into the vehicle. The bear was unharmed and last seen running into the brush. To view a video of the bear rescue go to the Humboldt County Sheriff’s Office face book page located at www.facebook.com/humboldtcountysheriff .